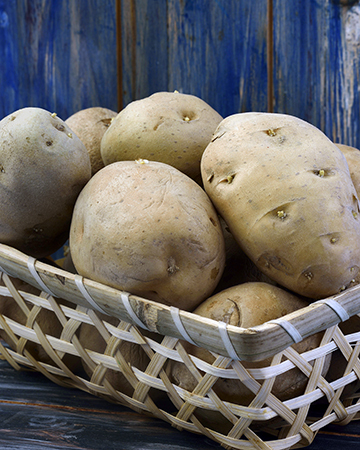 Whether mashed, baked or roasted, people often regard potatoes as comfort food. It is an important staple food and the number one vegetable crop in the world. The potatoes are the swollen portion of the underground stem which is called a tuber.They range in size, shape, color, starch content and flavor.The skin of potatoes is generally brown, red or yellow, and may be smooth or rough, while the flesh is yellow or white.As potatoes have a neutral starchy flavor, they serve as a good complement to many meals. Their texture varies slightly depending upon their preparation, but it can be generally described as rich and creamy.